My first Marathon. The Nike Women’s Marathon 2004. My first Marathon! The Nike Women’s Marathon. Organic Runner Mom’s First Marathon at the Nike Women’s Marathon in San Francisco 2004. My running attire and footwear sure has changed since then! I’ve got my game face on! Did you know that the first marathon that I ran was in 2004 in San Francisco, California? I ran the Nike Women’s Marathon with Team in Training and Raised money for the Leukemia and Lymphoma Society. It’s hard to believe that it was that long ago that I jumped into this crazy running game of marathoning! What made me decide to run my first one? I was in my first year of teaching as a first grader in a challenging school district. I was having a horrible time. I decided that I needed something positive to focus on. Since I had gotten into running when I moved to New Hampshire I decided to challenge myself with a running event. I was missing training for something. I had spent my life through high school and college and the first years after college with plenty of rowing goals. Now living in the middle of nowhere New Hampshire and feeling isolated I needed something. Organic Runner Dad was working seven days a week in our family business Pete and Gerry’s Organic Eggs and I was spending a lot of time on my own. I figured I might as well spend some of that time running. 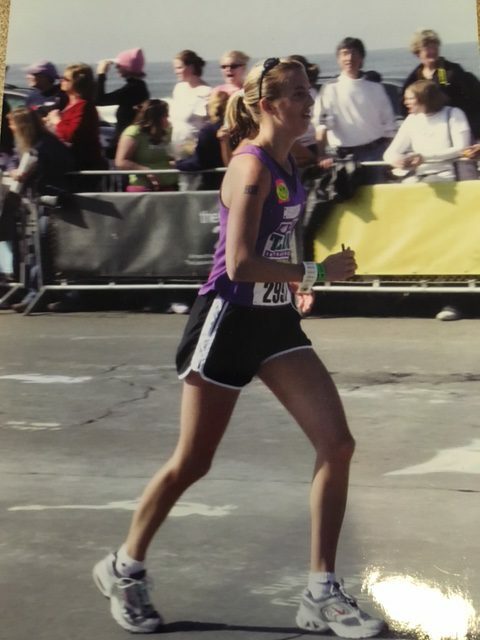 In Runner’s World Magazine I had seen advertisements for Team in Training so I went onto my slow desktop computer with dial-up and decided to look into seeing how I could sign up for a race. Unfortunately being someone that lived in a rural area there were no local Team in Training Teams to run with. I had to settle on running for the “Virtual Team in Training.” I would work with a coach online and do most of my training alone . . . Hmm . . . not much has changed in that regard (LOL). There was one race that I could train for with this team and it was the Nike Women’s Marathon in San Francisco! Ummmm, isn’t San Francisco super hilly? Why yes? This definitely made sense for a first marathon then! Sign me up? Without thinking much I got out my wallet, entered my credit card information and signed up to run and also to raise money for the Leukemia and Lymphoma Society. Training for that first marathon was hard as I had no idea what I was doing but on the other hand I had no expectations for a specific goal finish time since it was my first one. Looking back on it, having no goal time would be nice because there is no pressure. Fast forward to race weekend. Organic Runner Dad and I traveled to the race with my parents and enjoyed soaking up some of the sights around San Francisco including a cable car ride of course and some amazing seafood. I bought some race swag at the expo and we did a lot of walking around the city . . . not ideal for getting ready for a marathon but oh well. On race morning it was dark and we made our way to the start, a sea of women runners (super coo) and some men. There were also a sea of purple Team in Training tanks as this was a big race for Team in Training. It was pretty powerful to see so many people who were there to fundraise for this cause. I said goodbye to Jesse and hoped that I would see him and my parents along the course and then just got ready to run not knowing what was in store. The race course itself was scenic and yes, there were hills. I remember one hill winding upwards like a snake wondering if it would ever stop. I really had no clue how to pace the race other than to follow along with a pace band that I had printed out. My memory of most of the race is foggy but I do remember getting to the final section by the waterfront only to discover that it was an out and back to the finish and while we were slogging out several miles to the turn around the people going past in the other direction would be heading to the finish. This definitely took the wind out of my sails. As I ran I was definitely under hydrated and under fueled. I reached the finish in 4:21.52. Overall not too bad for a first marathon. I received my finisher’s Tiffany necklace (still the coolest medal I’ve ever received) and my space blanket and then immediately felt lightheaded. Somehow I made it to the medical tent whereI was giving fluids through an I.V., apparently dehydrated. My parents and husband were frantic to find me and of course this was way before any of us had a cell phone handy. They were all relieved when I finally emerged from the tent. Our celebration that night was the most incredible pasta dinner. I had to hobble to get there. Somehow despite ending up in the medical tent I decided after this race that marathoning was for me. I became hungry for more. Call me crazy . . . I have run many more marathons since that first one and each race has been different. I am a much different runner now and have gained so much from each race experience including this first one. It has taken many years and a lot of training, dedication and determination to get where I am today with the marathon. 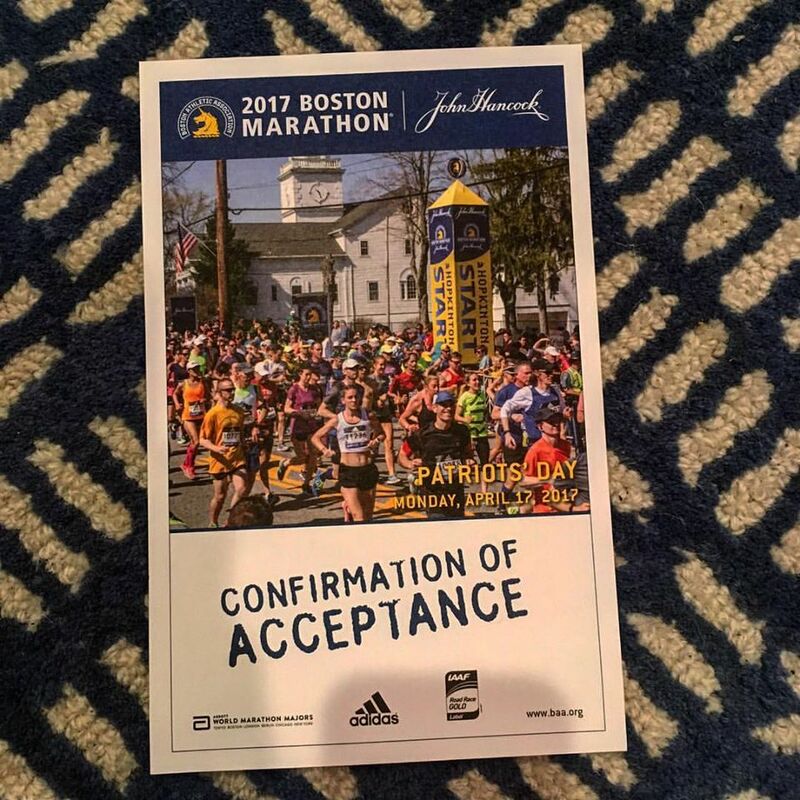 This spring I will be running my fourth Boston Marathon and in less then two weeks I’ll be racing my first New York City Marathon with Team Clarke! I am in! Boston Marathon 2017 here I come! What was your first marathon? Did you know what you were doing during your training and on race day?